The weather is warming and so are the waters around Cape Cod. As we find ourselves outside more for beach parties and backyard cookouts, now is a great time to experiment with Gustare’s twists on a couple Cape classics. Enjoy! Yes, we love lobster salad with mayonnaise! We don’t want to mess with the gold standard, but sometimes mayo-from-a-jar is too heavy. Aioli is mayo, but it’s made simply, like, in 5 minutes at home. This version uses healthy Herbes de Provence extra virgin olive oil, rather than vegetable oil. 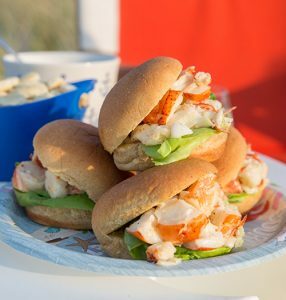 The influence of herbs brings out the flavor of our Lobster Rolls. 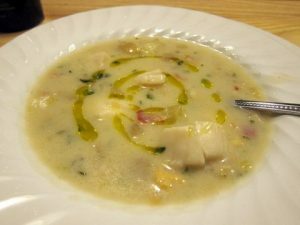 Much like “lobsta” salad, the Gustare version of clam “chowda” respects the tradition but makes a few adjustments. For example, pancetta, rather than bacon (which can be too salty or fatty). Fresh scallops and pancetta impart wonderfully subtle flavors not commonly found in most traditional thick chowders. Also made with with Herbes de Provence olive oil, the recipe recommends saving a little extra for a flavorful drizzle to enhance both taste and presentation.